Reading this book took me back to Margaret Mead’s Growing Up in New Guinea, a more scholarly work that explores similar aspects of tribal culture: the kastom or taboos that have to be learnt in order to be a functioning member of the tribe.Â Whereas Mead was, on the whole, a passive observer, Williamson sets out to learn the culture from the inside, determined to become a “man bush”–a full member of the tribe.Â His quest brings him close to death on more than one occasion, whether from disease or from a failure to get kastom right.Â It’s possible that only the affection he inspires in his friends keeps him alive, as he makes blunder after blunder. The exploration of the man bush culture is fascinating, but the book is also frustrating for what Williamson leaves out.Â As a man learning the men’s ways, he’s apart from the women of the tribe.Â He provides some fascinating details of the women’s lives–for example, they’re expected to give birth alone, and in silence–and there are photographs that demonstrate their importance in the tribe’s day-to-day life, but we learn very little about how they spend their time, about the work they do.Â From Williamson’s point of view, everything important is done by men, presumably because their lifestyle is what he needs to learn so he can preserve his anatomy from dissection. We learn about hunting and the men’s rituals, but Williamson never touches, for example, on how the huts shown in his photographs are built, or by whom.Â We’re given intriguing insights into the justice system–kava-induced hallucinations tell one chief that a child’s apparently natural death was in fact brought about by a particular man, who then must flee for his life.Â There’s no appeal, but he manages to stay safe for a month, and is then forgiven and welcomed back.Â Evidence as we understand it counts for nothing; these people’s evidence comes from the spirits and the natural world.Â As the book goes on, we see Williamson becoming absorbed into the tribe’s way of thinking, and much more accepting of their worldview. At one point, he joins in a violent beating of a guest who’s breached kastom.Â Is it because he would otherwise be violently attacked himself–as he surely would?Â Or because the breach is now as meaningful to him as to his tribal brothers? The man bush life is harsh, and their ways appear cruel and unjust.Â Women are subservient to men, and can be beaten.Â Yet at the same time, children are loved and cared for.Â It’s a way of life adapted to their environment, and the intrusion of missionaries does not necessarily confer benefits on the people–and nor does the sudden acquisition of wealth.Â Williamson tells the tale of his time among the men bush without romanticising–except perhaps towards the end.Â Yet, given that Williamson dedicated years of his life to learning these people from the inside out, I can’t help feeling that the book should be twice as thick. This book would be a valuable acquisition for anyone interested in different cultures and ways of engaging with the Earth, or for a writer looking to build Fantasy or alien worlds.Â I’d be very happy to keep it! 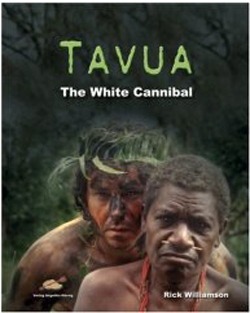 1 user commented in " GUD Reviews: Tavua: The White Cannibal by Rick Williamson "
I no this person for all most (15 years) till he did something to me this year. He try to run me off the road in his car Hamilton. With all the things with the white cannibal, I think it his got to me and made him sick. I do not think these books be read as it will make you sick as well.